Today was shipping day for the last of the pieces for NEB's Crown and Pin Pub. 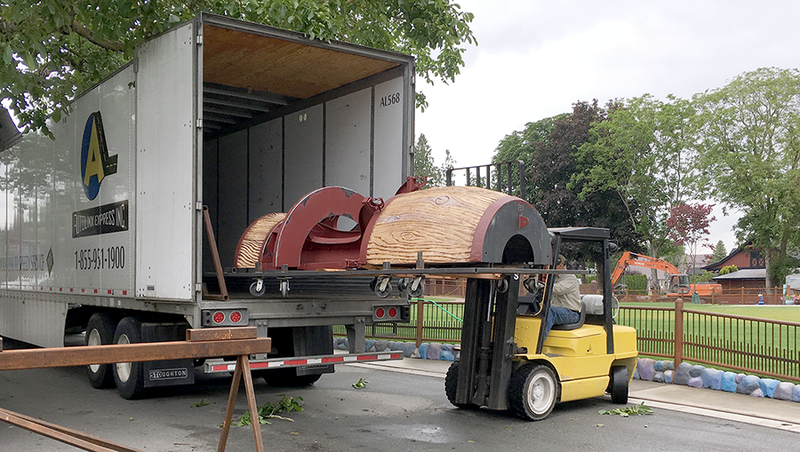 The giant stills (halves) were carefully lifted with the forklift and one end was gently tucked into the large trailer. The other end of the heavy piece was set on a large metal sawhorse which we built for just this purpose. We then detached the castor wheels so we could them slide them to the front of the trailer using our custom pushing rig that fit over the forklift forks. The whole process for the four large pieces and two smaller pallets took less than forty-five minutes. After signing the proper documents we sent the shipment down the road to our client.